in India is about to begin. 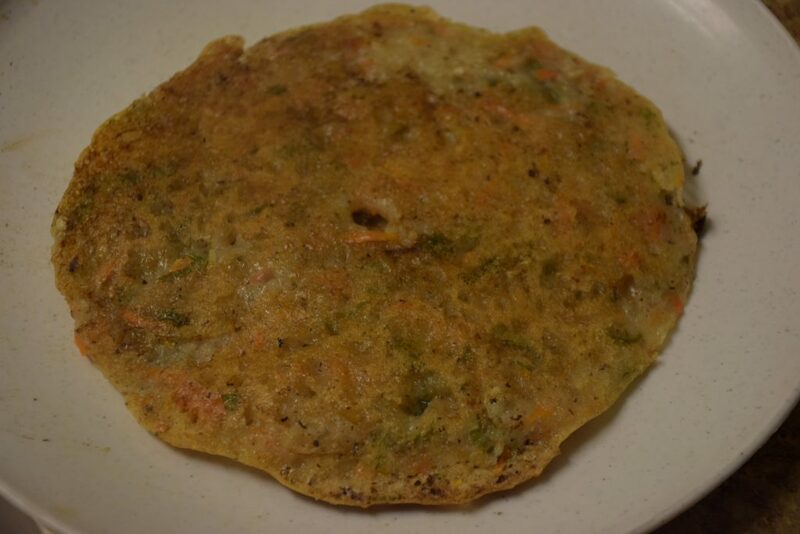 Last year ,I tried this recipe of Sabutdana Cheela (Sago pancake) and I was happy with the results too. I wanted to eat something non-oily or fat-free kind of food during fast. Hence I used negligible oil while making them. 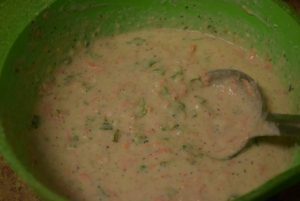 I have , however,made some using generous amount of oil too, so for those who like them crisp use more oil and for those who love to devour fat-free use lesser oil . 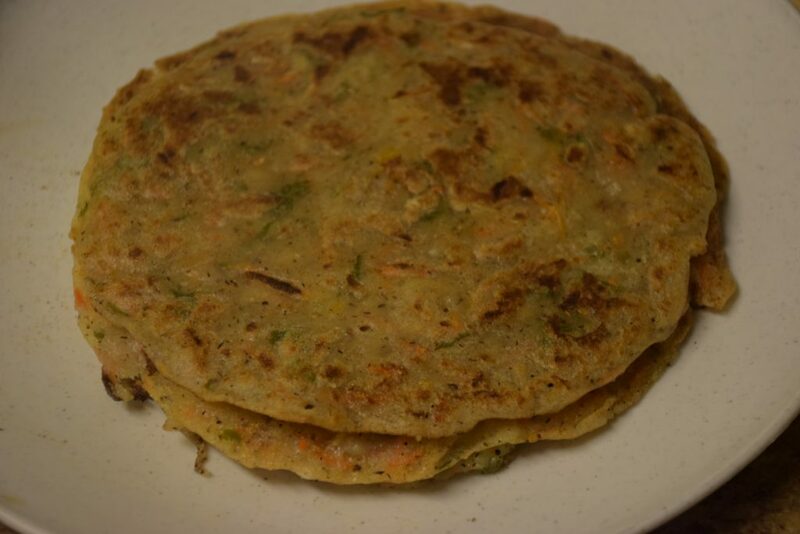 This recipe is flexible and you can adjust the ingredients as per your liabilities and taste. I know many people avoid vegetables or chillies too during fast. So lets soak in the spirit of Navratri and cook some delicious offerings for our Goddess ! 1. Soak the sago pearls or sabutdana for at least 1 hr. I soaked them for 3 hrs in equal water or fill it with as much water as it is just above the pearls. They are ready to use when they have absorbed all the water , swelled up and are dry. Too much water would make them soggy and release their starch making them sticky. 2. 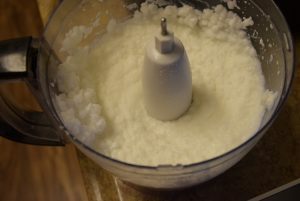 Grind these soaked sago in a food-processor or a mixer into smooth fine paste. You may add some curd to help in grinding. It is fine if 2 or 3 pearls are left intact. 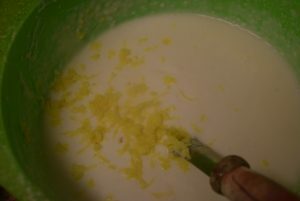 Take this mixture out in a mixing bowl. 3. 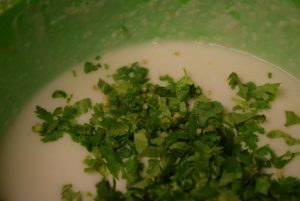 Now add the remaining curd and whisk them neatly. Also add the grated ginger ,rock salt and black pepper. 4. For those who don’t eat vegetables during fasts may skip this step. Add all the veggies and mix them. 5. 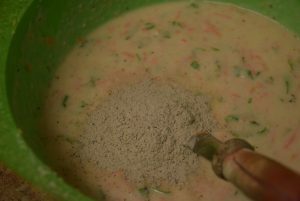 Now if you feel the batter is too thin, you may add a small amount of Amaranth / buckwheat/ Samo rice flour in the batter to thicken it. Also add cumin powder and mix all well. 6. 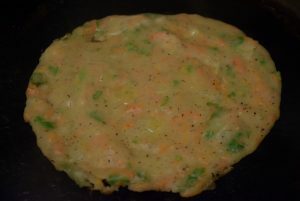 Preheat a non-stick skillet or griddle at medium heat. Take a wooden skewer or wooden ice-cream stick for creating a hole in the center while spreading the batter. 7. 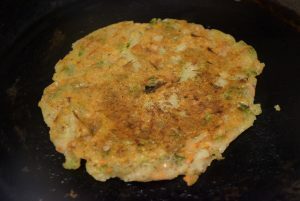 Test the tawa(griddle) by sprinkling some water on it, if it evaporates instantly it is ready. 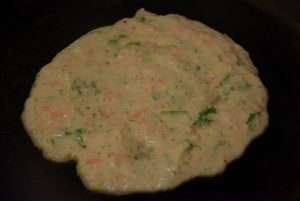 Now add 2 tbsp of batter or more in the center and spread it with a bowl or back of the spoon on the hot tawa in a thick layer. 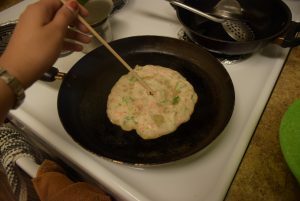 Also at the same time, or just after spreading the batter , dig a hole in the center of the batter with a stick. 8. Add oil all around the edge and in the center-hole. This helps in good and even roasting of the batter.Let it bubble on one side. 9. When you see the batter has settled and has dried , flip it with a wooden spatula on the other side. 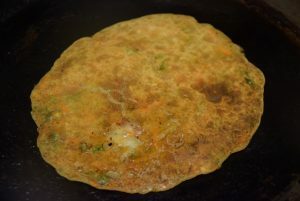 The above image is of the cheela made with less oil. 10. 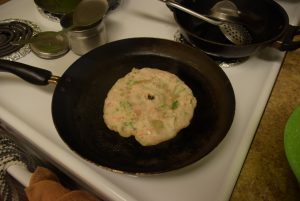 Let it cook on both sides, and when you see brown spots on the second side too ,take it out in a plate. 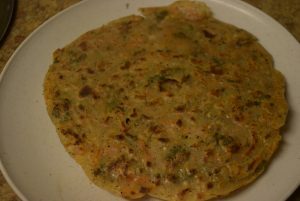 This cheela has been made with more oil. 11. 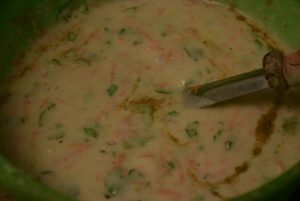 Serve them warm and fresh with curd or Ras-e-wali sabzi (potato curry) . 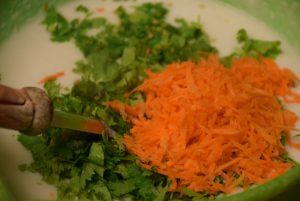 These vrat (fast) dishes are not only delicious for the taste buds but also healthy and keep our body’s state calm and clean. Hope you have an enjoyable Navratri with these dishes and feel connected with Almighty again! 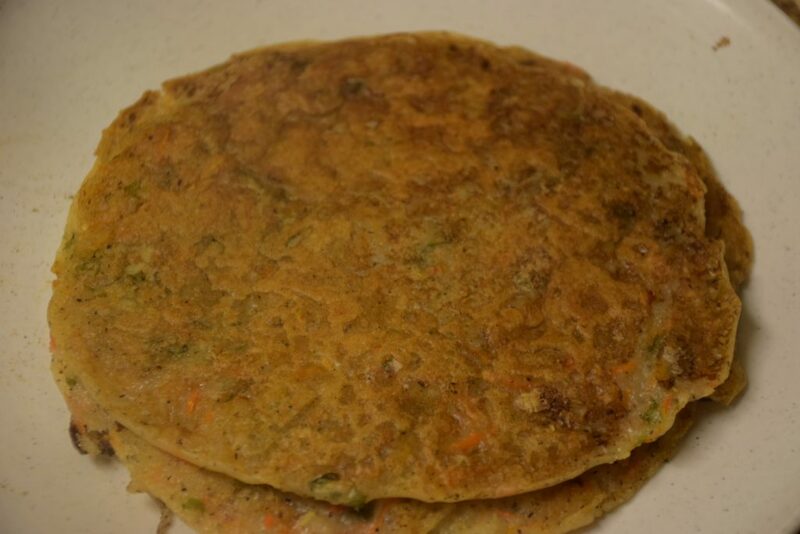 This entry was posted in Appetizers, Food, Recipes, Vrat Recipes and tagged ayurvedic best salt, Carenshare, cheela, dosa, fast, fat-free, flexible, healthy, home-made yogurt, less fat, Ma Durga, navratri, ras-e-wali sabzi, rock salt, sabutdana, sago, sendha namak, shweta jindal, tapioca pearls, uttapam, vrat, without haldi, without salt, zindagisikhati.